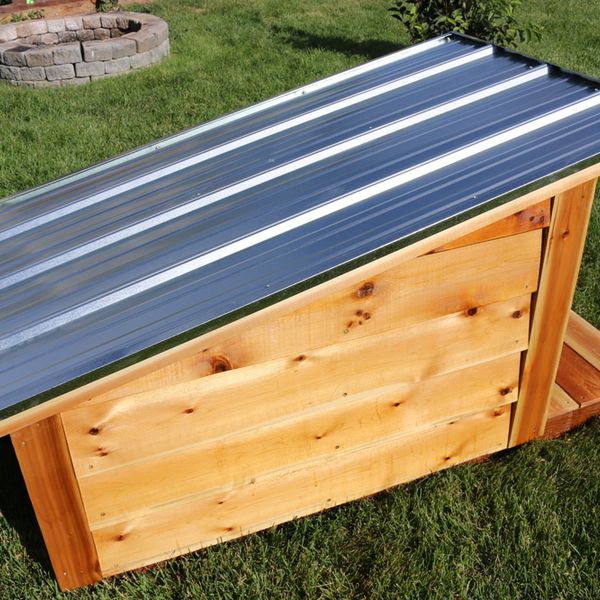 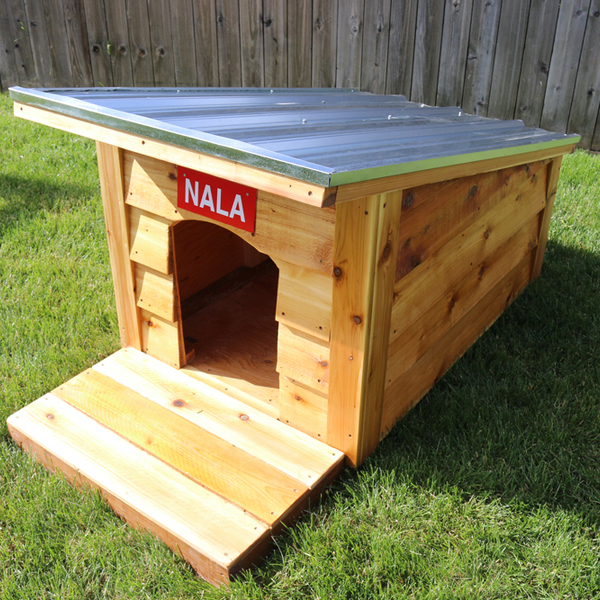 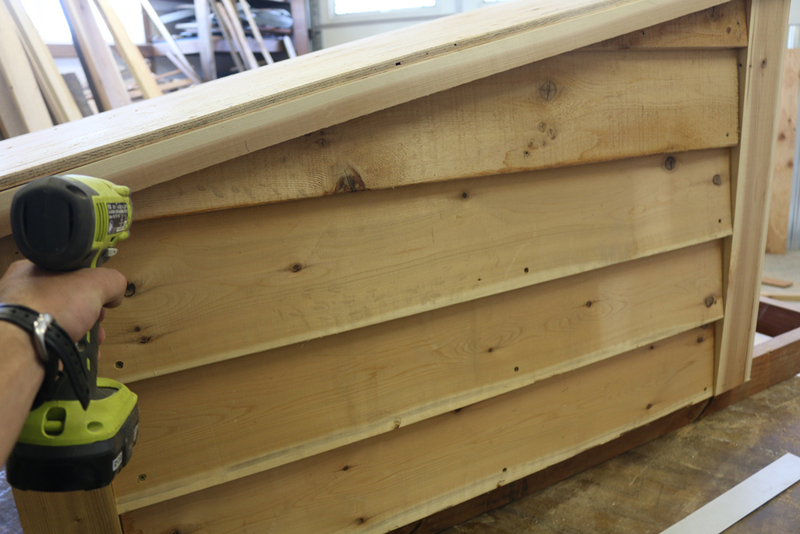 In this project you'll learn how to build a dog house with wood siding and a metal roof. 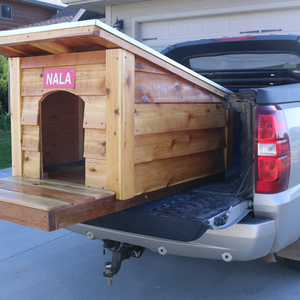 The dog house is made to fit a medium to large sized dog. 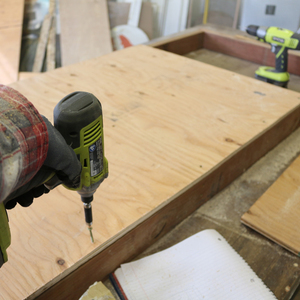 We'll start by building a platform. 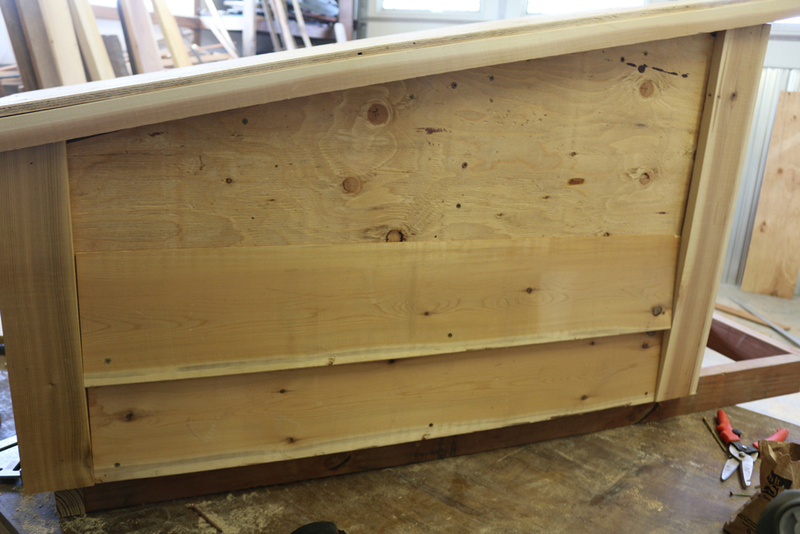 Followed by framing out the walls and adding a roof, siding, and deck. 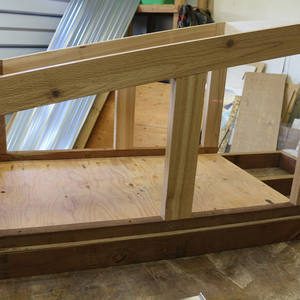 This small scale project is a building block towards learning to build enclosed structures. 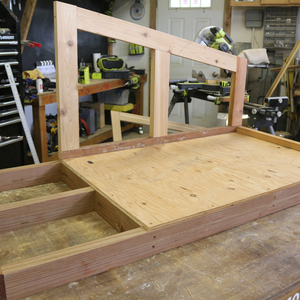 The first step is to create the platform for the doghouse and deck. 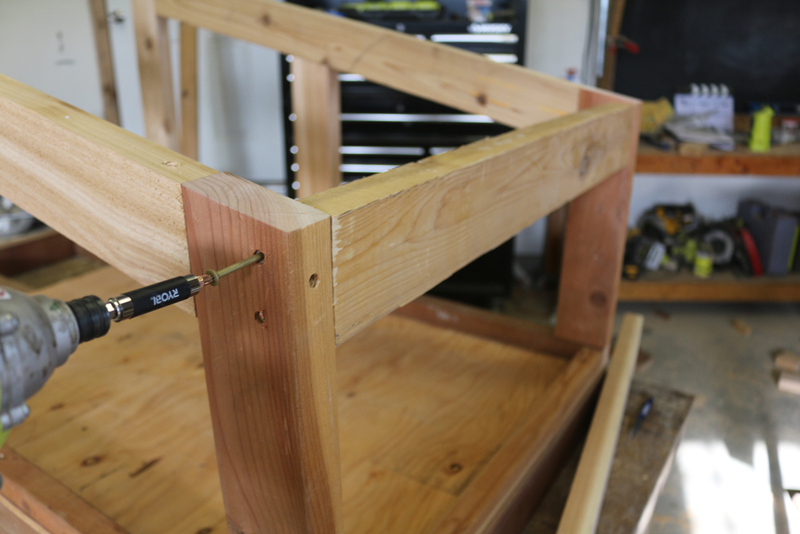 Use pressure treated 2x4's for this process. 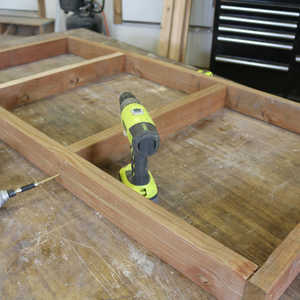 Connect each board using 3 inch screws. 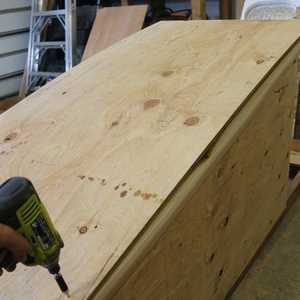 Cut the plywood to cover the base area which the dog house will sit on. 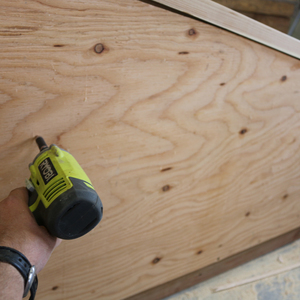 Attach the sheathing using 1 1/2 inch wood screws. 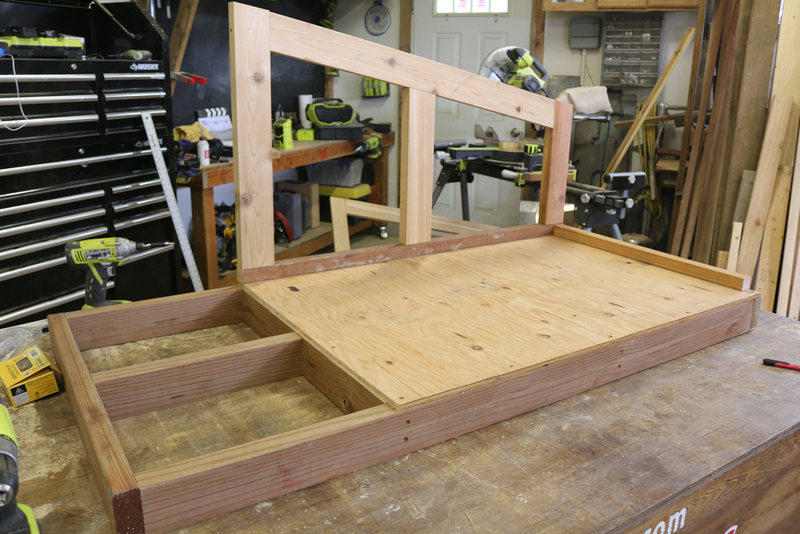 Build the sidewalls for the dog house. 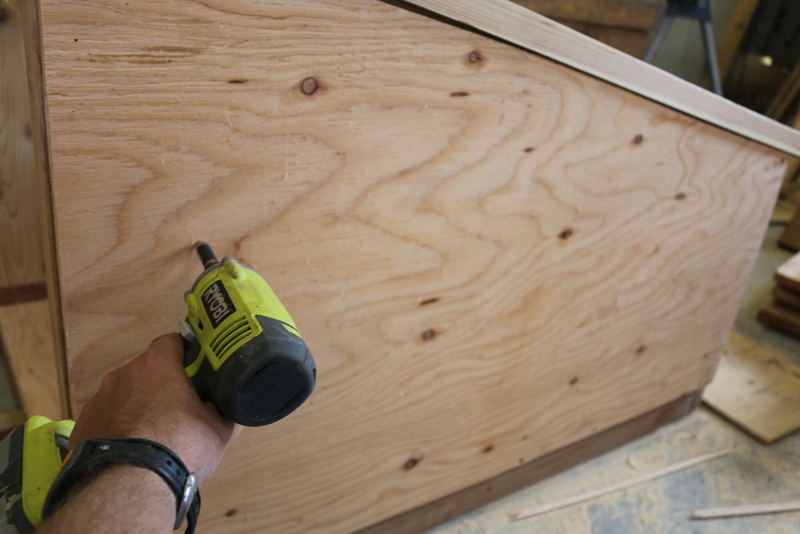 Use 2x2 boards for the bottom of each wall. 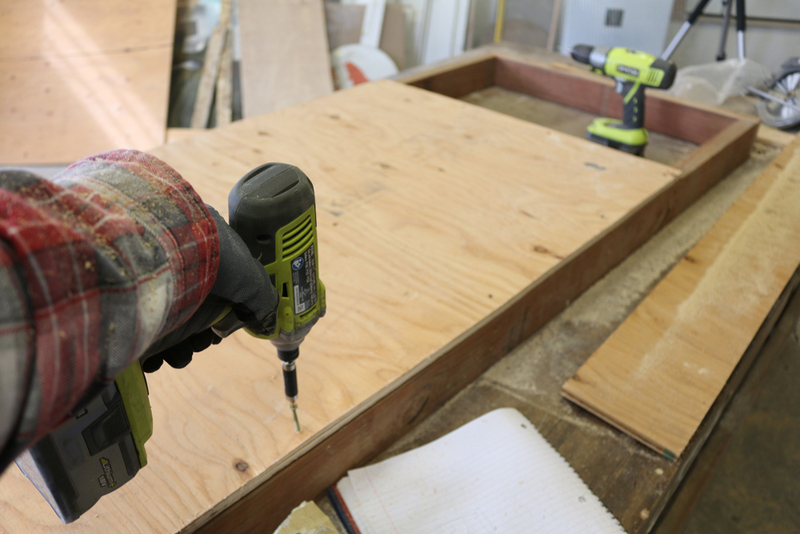 2x4 boards are used for the rest. 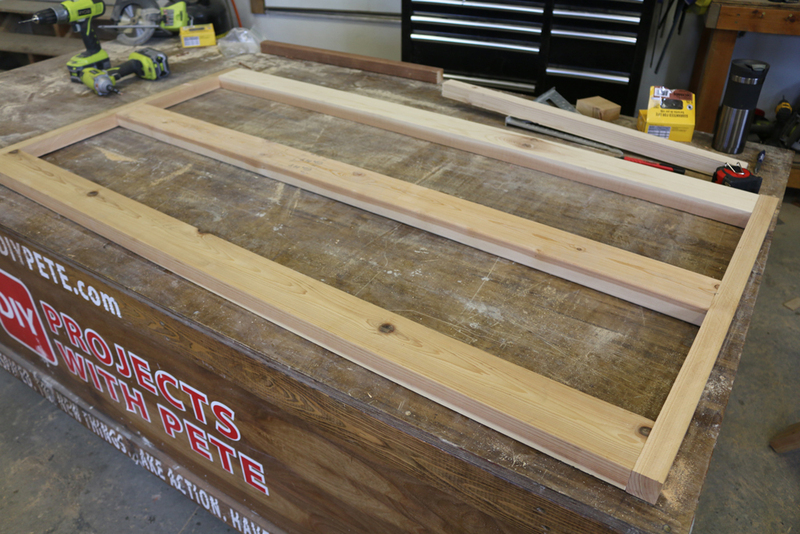 Cut the front and back boards so they have a 12 degree angle. 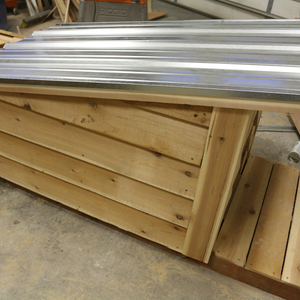 This will give a nice pitch to the roof. 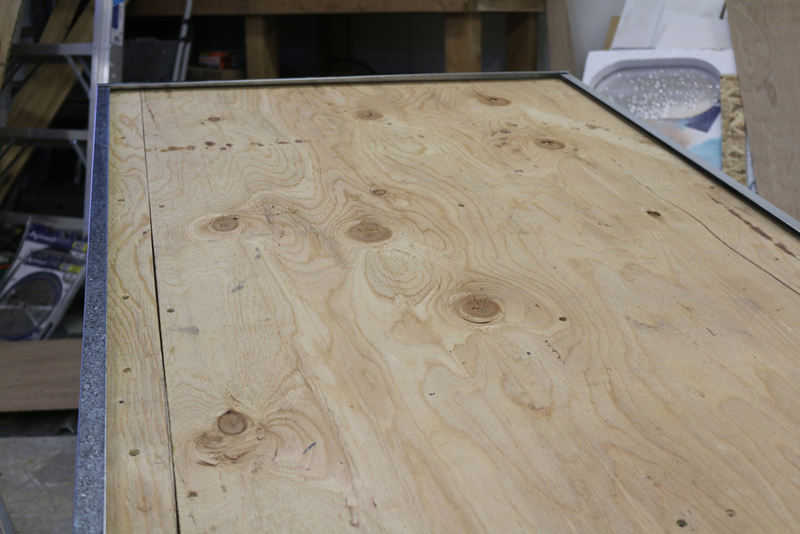 Connect the sidewalls on the back side with a 2x4 up top and a 2x2 against the platform. 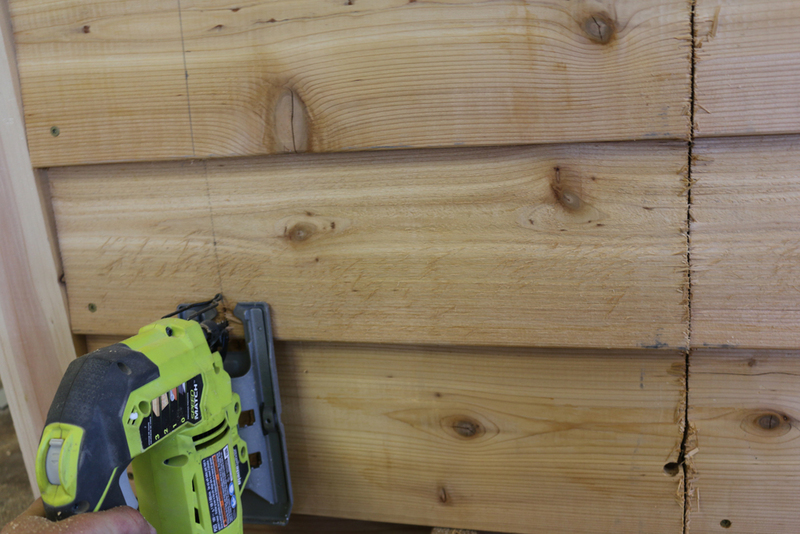 Connect the front of the sidewalls with a 2x4. 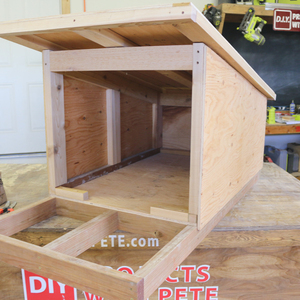 This is what the dog house will look like once it is framed out. 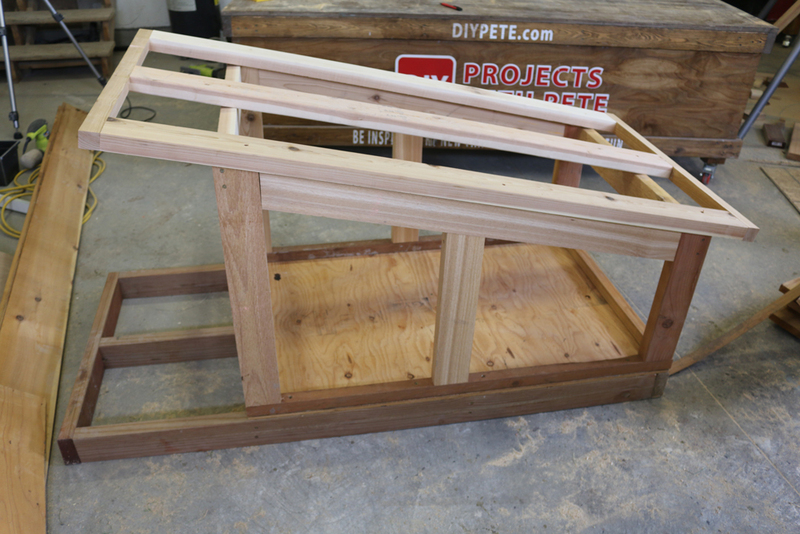 Create the frame for a simple roof out of 2x4 boards. 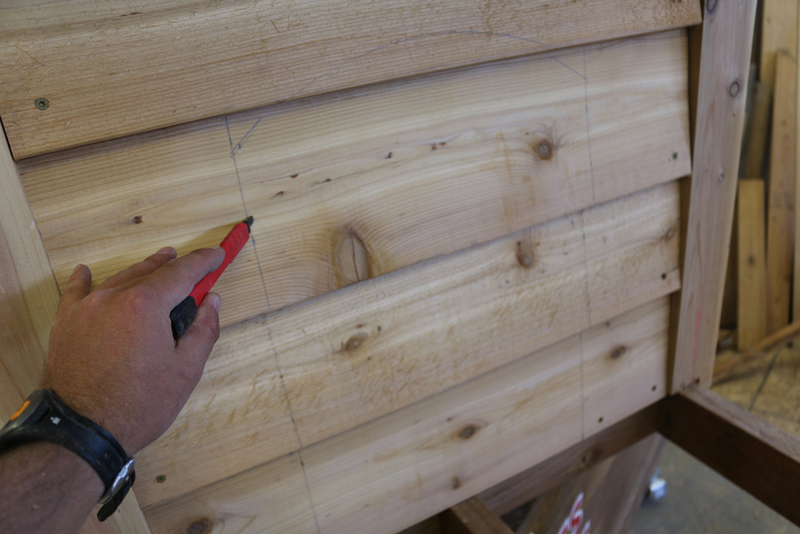 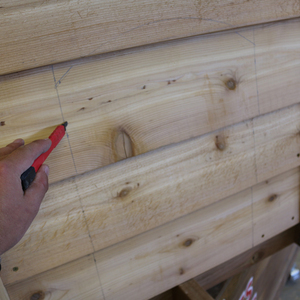 Make sure it overlaps the sides at least an inch and a half to accommodate the sheathing and siding. 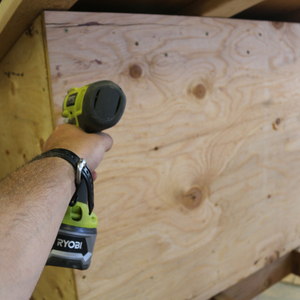 Attach the roof to the walls using 3 inch wood screws. 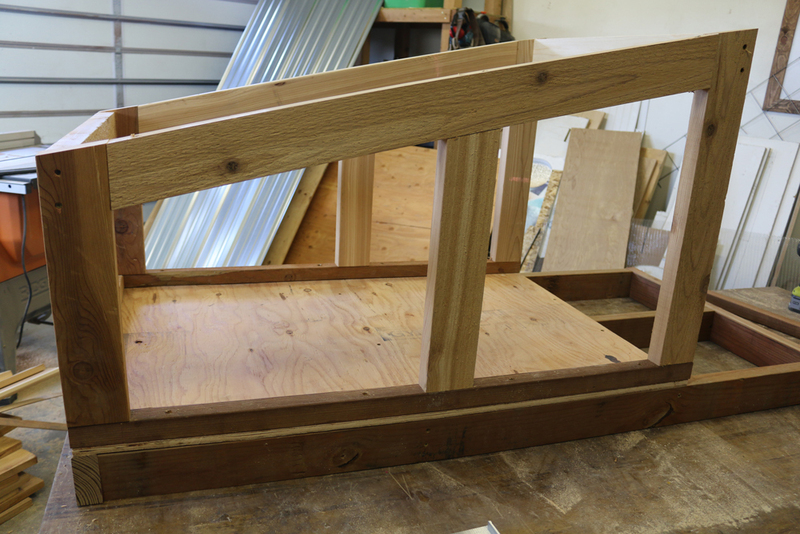 It overlaps toward the backside about 4 inches and has a nice overhang in the front for shade. 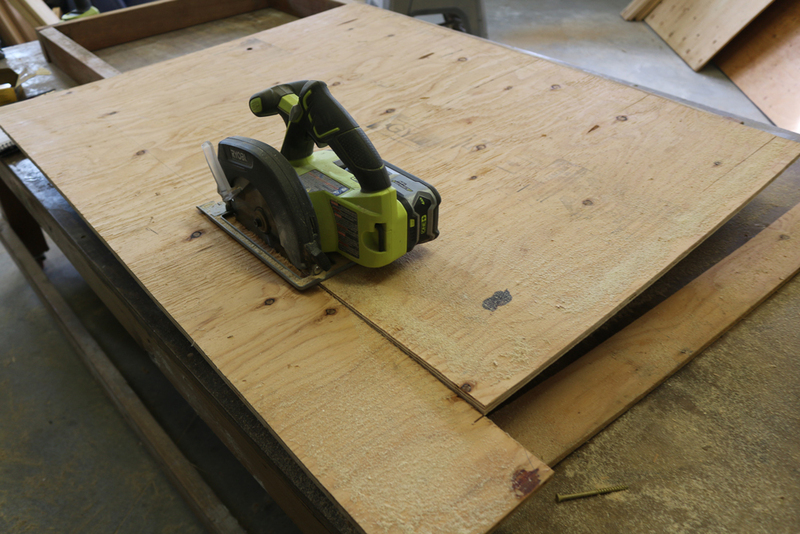 Use a circular saw to cut the sheathing down to size for all 4 walls and for the roof. 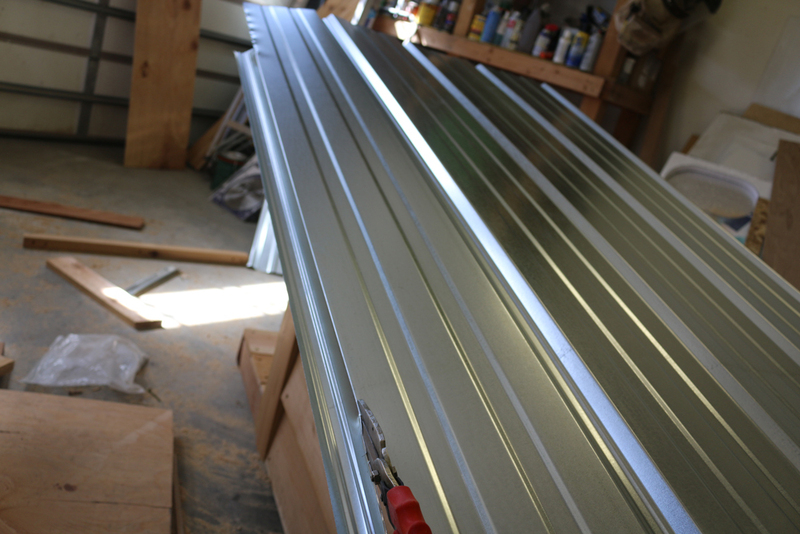 Screw on the side sheathing. 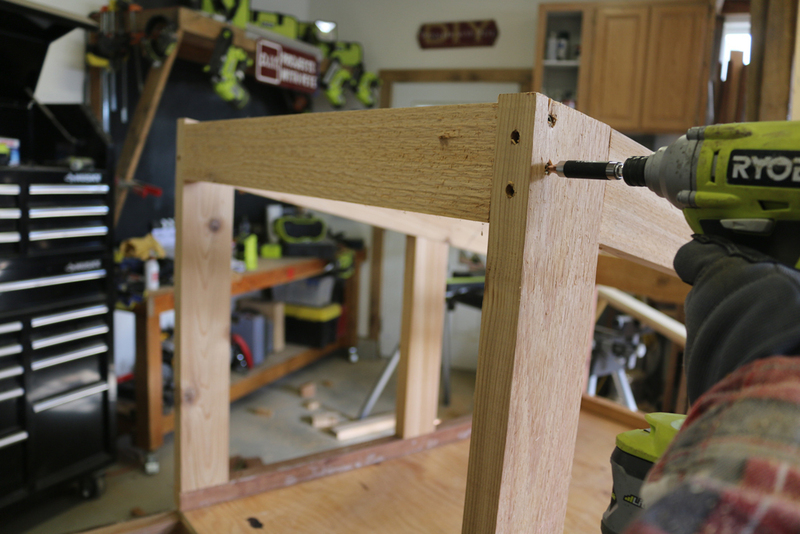 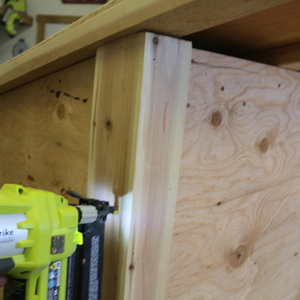 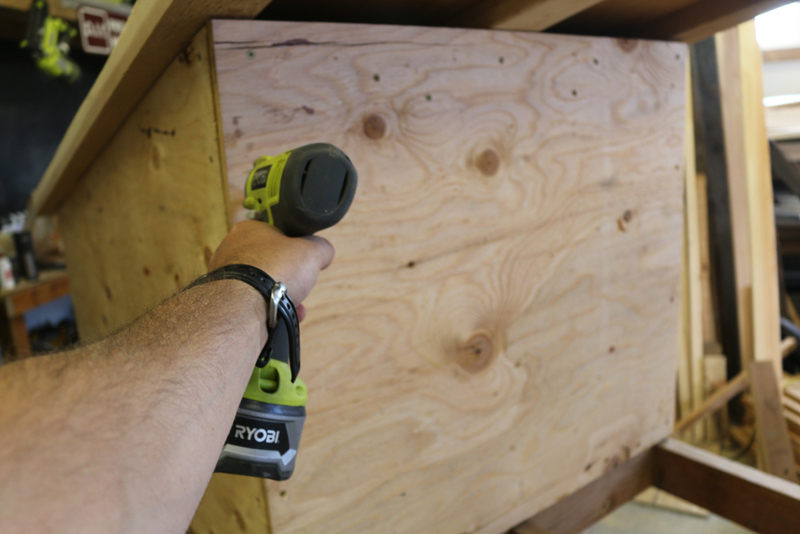 Use 1 1/2 inch screws and make sure you are connecting the plywood to a 2x4 or 2x2. 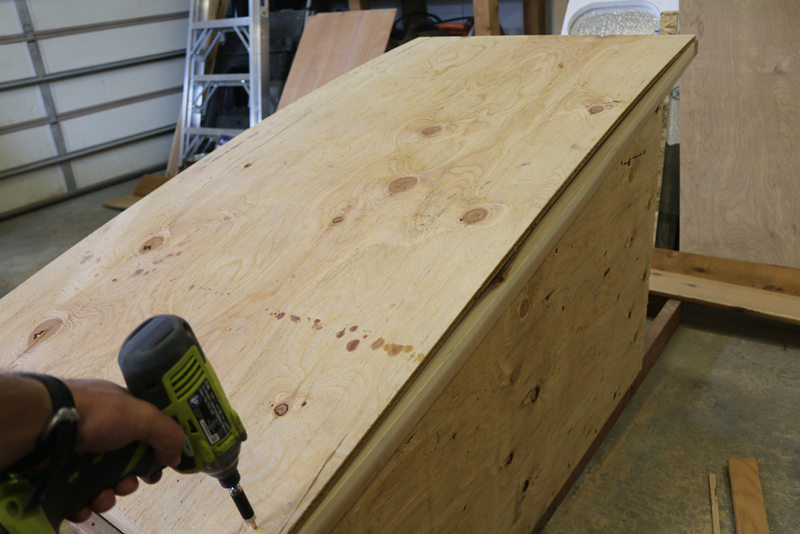 Attach the sheathing to the roof with 1 1/2 inch screws. 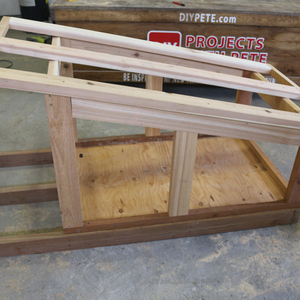 Here is a look at the dog house once it is framed and enclosed. 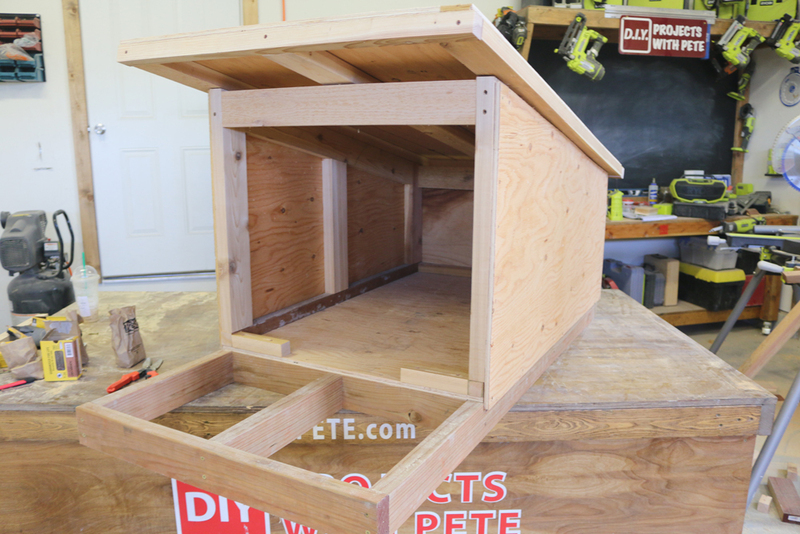 Determine how wide you'd like the dog door. 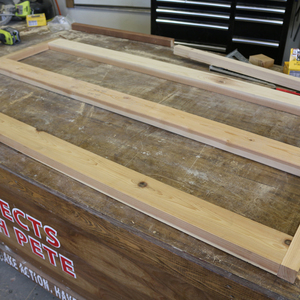 Then add 2x2 boards to give the front a bit more support. 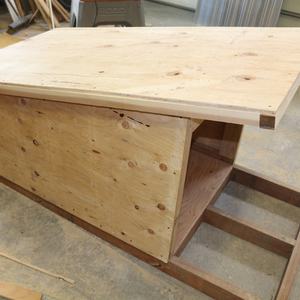 Add a front panel of sheathing. 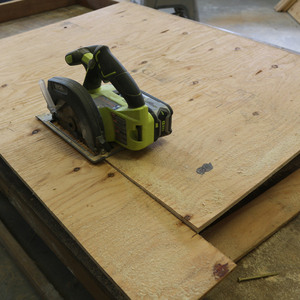 Cut 1x4 boards down to size for trim. 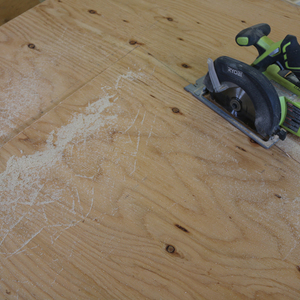 Use 2 boards at each corner. 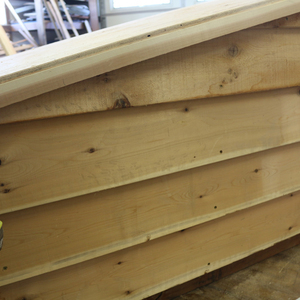 Add siding. 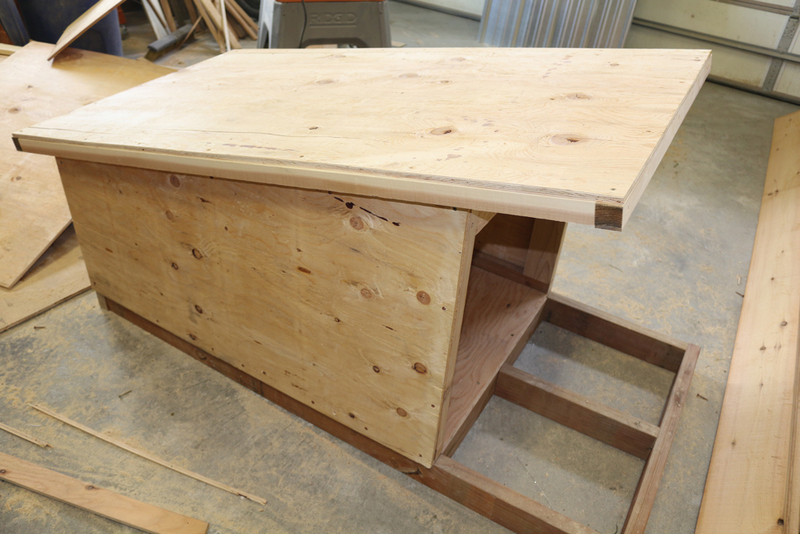 Start from the bottom and move your way up. 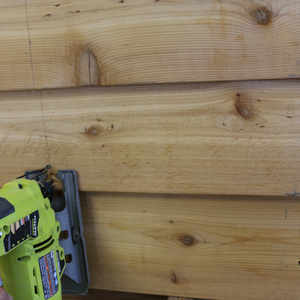 Use 1 1/2 inch screws through the siding and into the studs. 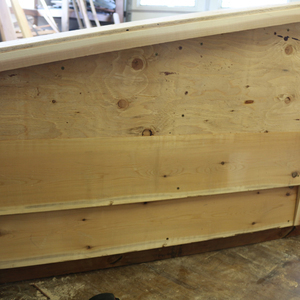 A look at the siding once attached. 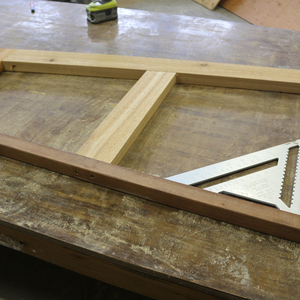 Draw the shape for your dog door. 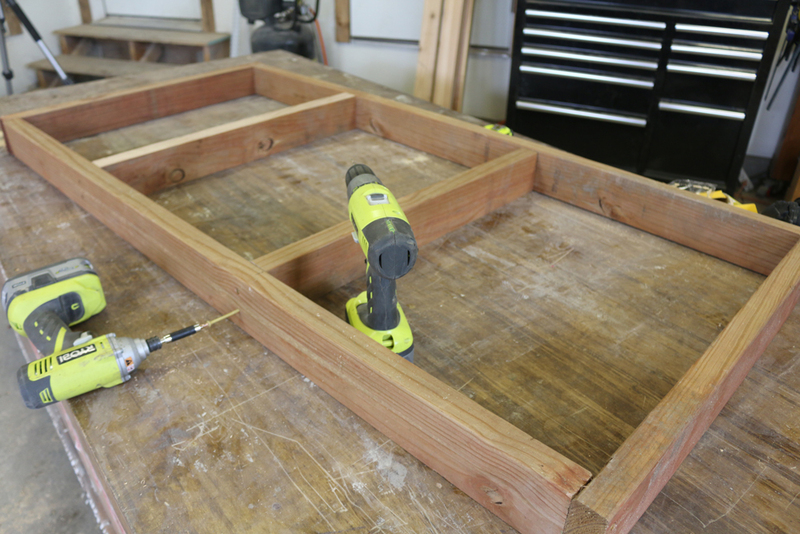 Cut out the dog door using a jig saw. 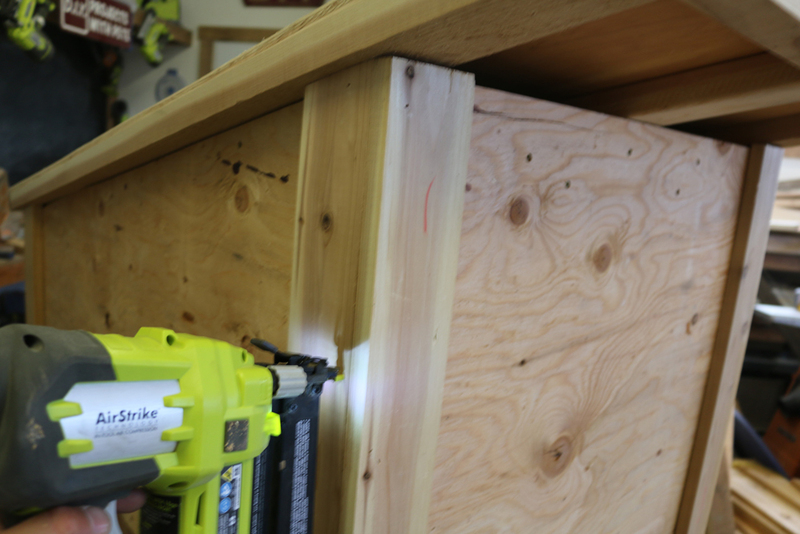 Drill a small hole to create a starting point for the jig saw blade. 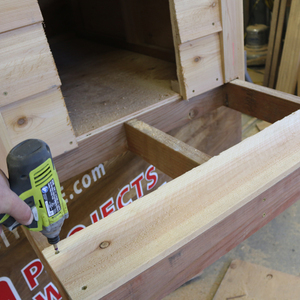 Cut fence pickets down to size to use as decking for the front of the dog house. 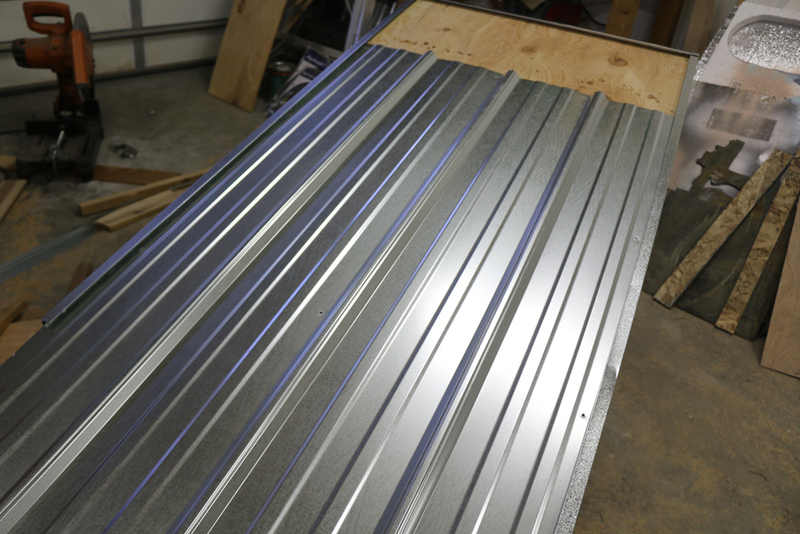 Cut the metal roofing material to cover the roof. 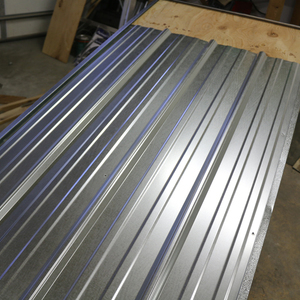 If you do use metal for the roof (instead of shingles) it will have sharp edges. 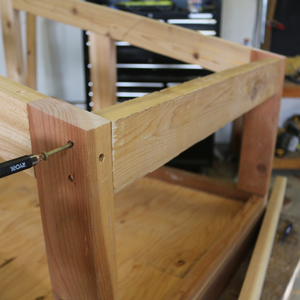 I used J channel to help cover the edges. 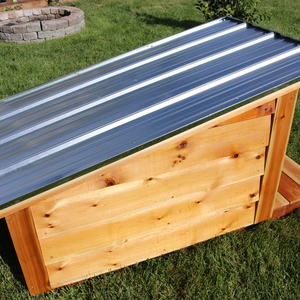 A drip edge could be used. 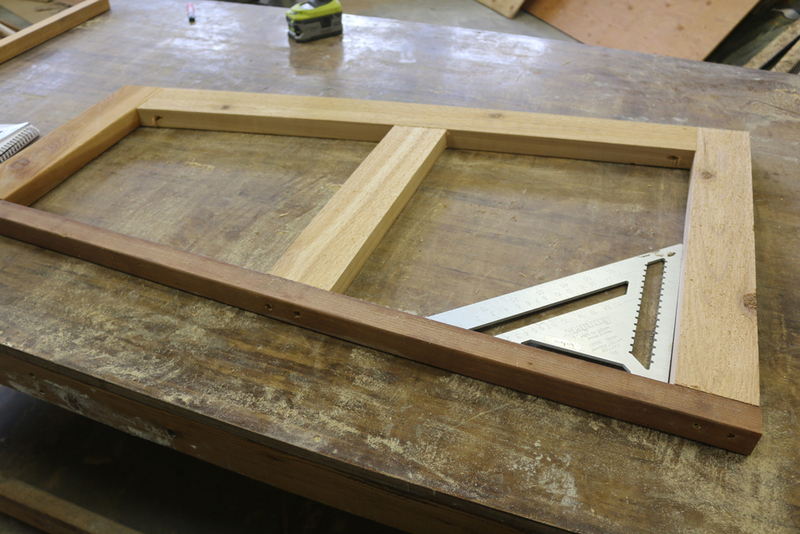 I attached J channel around the perimeter of 3 sides to help cover sharp edges. 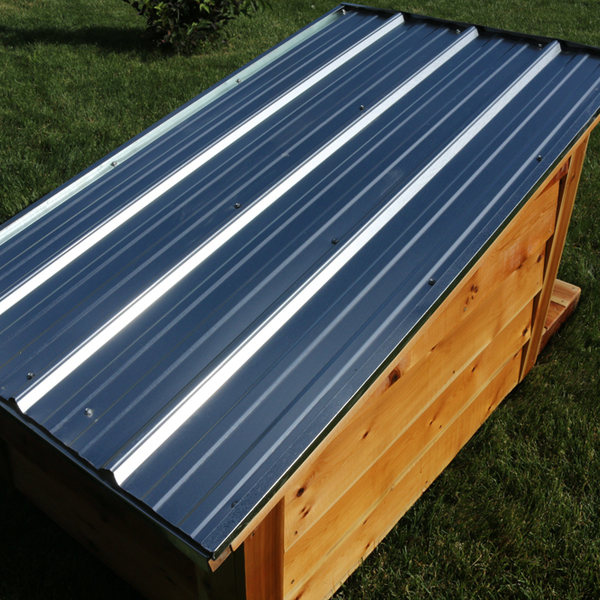 I actually stuck the lip of the metal underneath the plywood roof top. 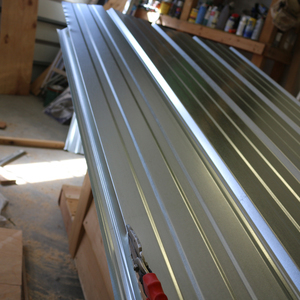 Slide the metal roof into place. 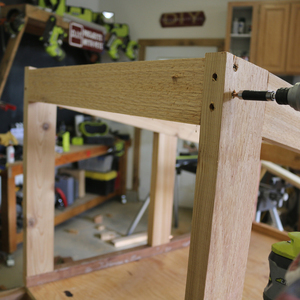 The ridges make it a little tight on the front and back, but not bad. 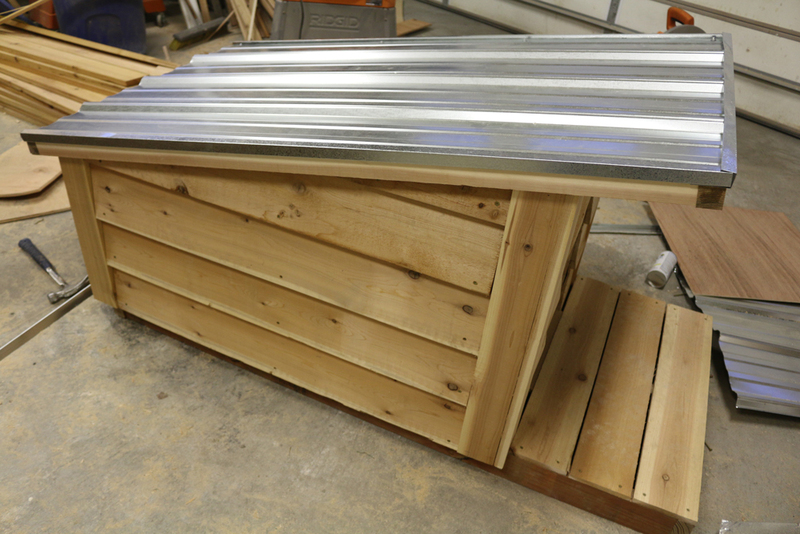 I used a basic drip edge on the backside of the dog house. Here is a look at the dog house with the roof finished. 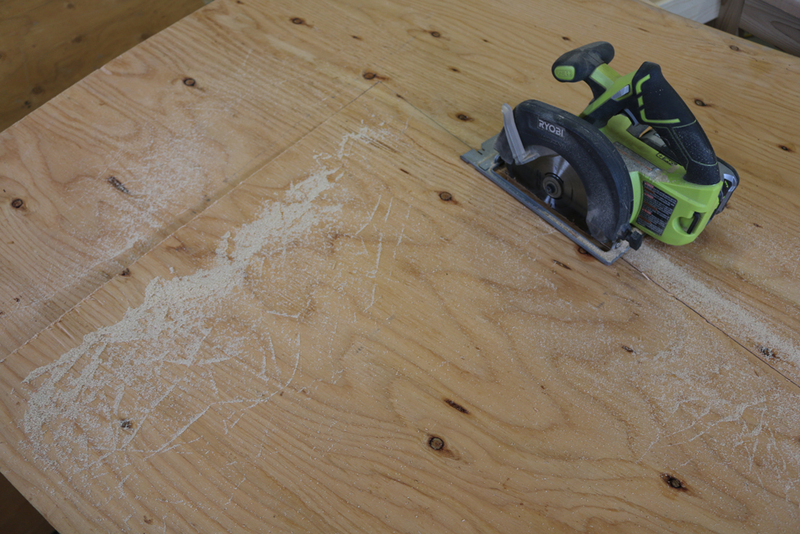 Make sure to do a thorough sanding of all the wood to remove rough edges and smooth things out. 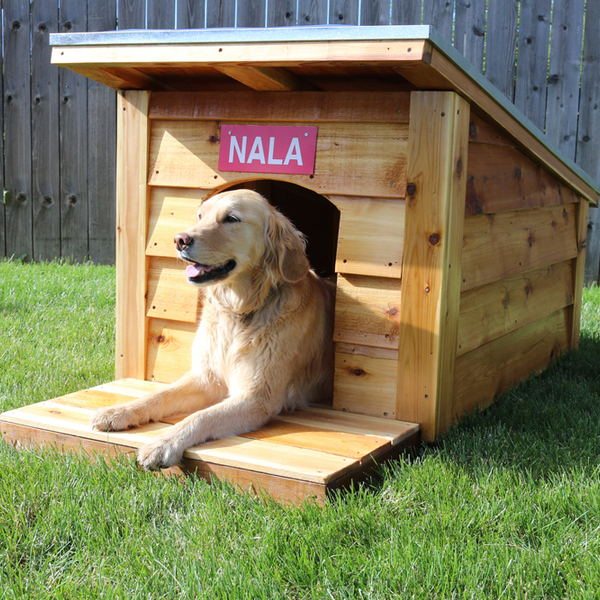 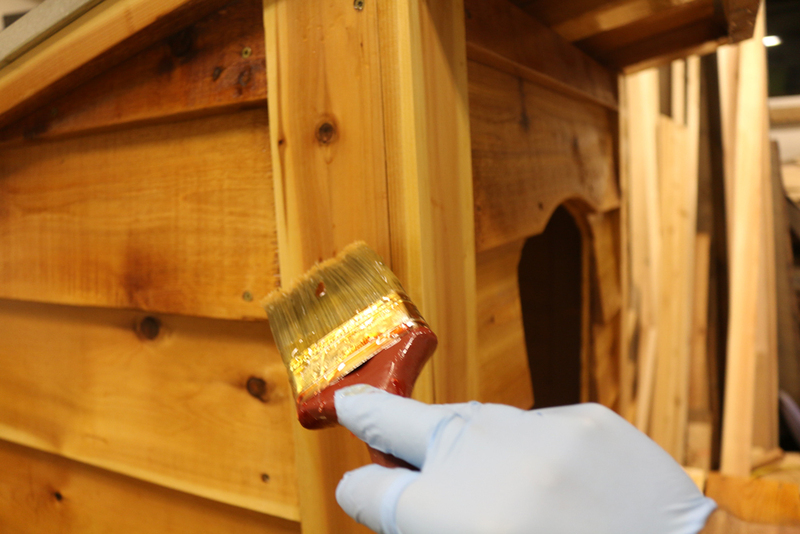 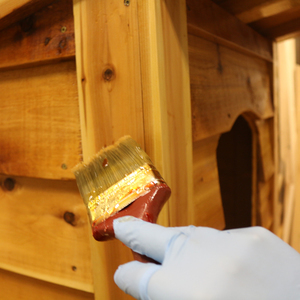 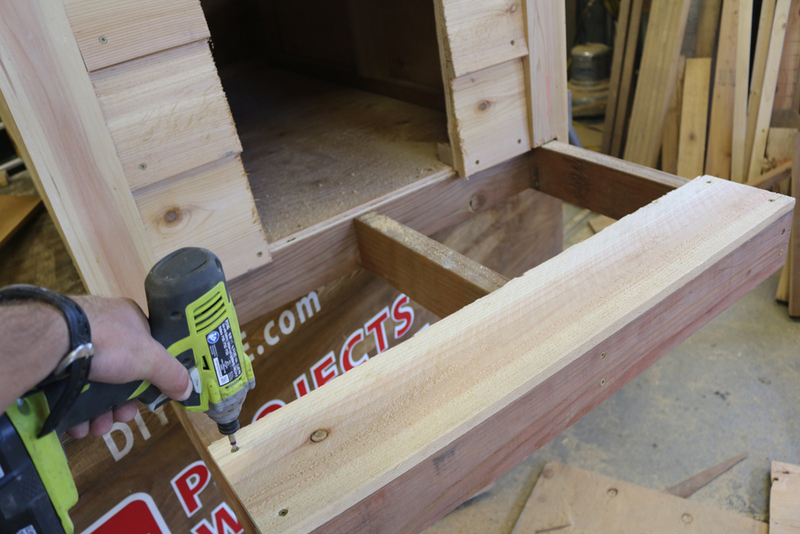 Stain or seal the dog house with your finish of choice. 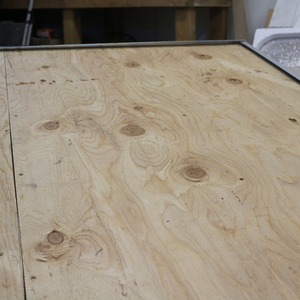 I used a spar urethane. 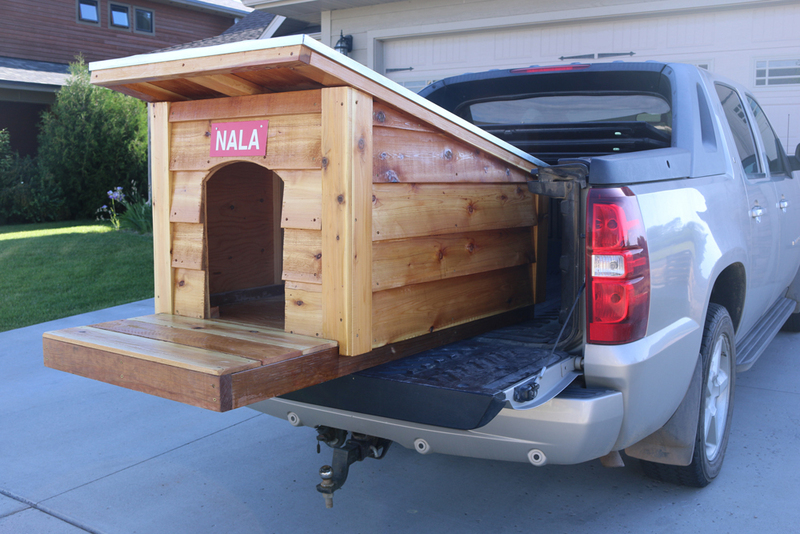 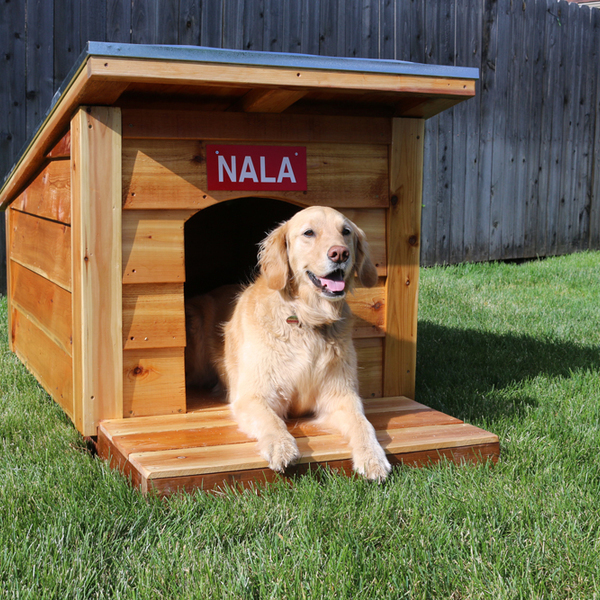 Move the dog house to your yard or load it in a truck and gift to a friend or family member!